I’d love to hear from you! You can either contact me by writing a comment here on this page, or you can write me an email. I looked at your Flickr gallery, your images are pretty high quality I thought. When I take pictures of my characters I try to take them during the day with good weather conditions, (not raining or foggy) I try to find the light, meaning I face my character so the sunlight highlights them the best. For full body shots I scroll my mouse wheel, zooming in, until their feet are at the bottom of my screen but still visible. Another trick I use sometimes is to stand my character in front of an object (mailbox, light post…) Then I pan the camera till its in front of the object still looking at my character. What this does is to bring my character closer for great up close pictures. This is Calameril from your kin! I’ve been trying to put together a questing outfit for Cala that has a wood elf vibe, yet still looks caster-y. The fact that she can only wear light armor and my Captain alt is level 31 complicates things. 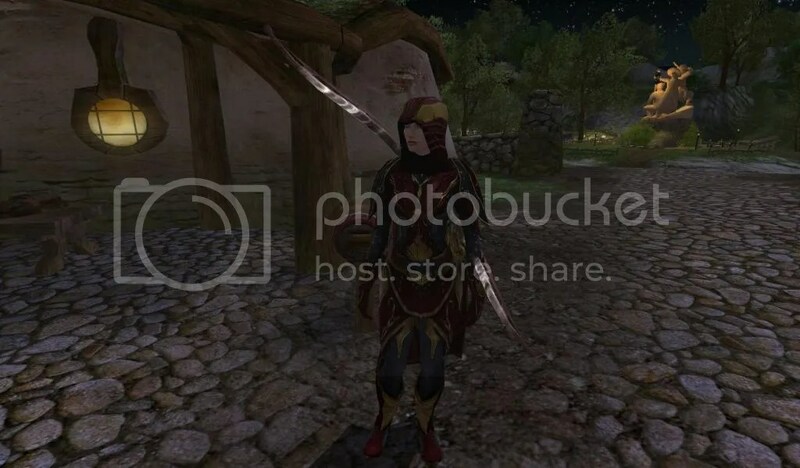 Right now she’s wearing Robe of the Grove (quest reward from the Trollshaws), the Summer Travelling Cloak, and Limdail dyed Sienna (light boots, quest reward from somewhere). It’s an okay outfit, but I’m not really satisfied. I like the short robe look for a traveling caster, although tunics and trousers are good too. Can you give me some tips? You totally inspired me to make Wood Elf outfits! I know some of those you can’t wear yet but the first one on that post I made with you in mind. The Robe of Viisaus is a quest reward from Book 1 or alternatively you can get the ceremonial version from the store. This might be your first 5 ring outfit if you can make it. I’m level 65 hunter and want to look stylish while having decent gear. This is because you can’t wear outfits in the Moors. You can still toggle armor, but can’t have anything cosmetic. Currently, I just have my gear dyed forest green. I like standing out in the Moors and don’t want to look like everybody else. This is what I’m currently using http://twitpic.com/5qumct http://twitpic.com/5qum17 I like how the color makes me stand out, but that’s about it. My hubby, Ked spends a lot of time in the Moors. He likes to look good also. The best advice I can give you is what he has done and that is to dye your armour the same color. Because of family and work we are both pretty casual players. We don’t currently have access to raid gear. Ked’s current equipment is mostly Moria gear. He feels a little squishy at times in the Moors but does alright. Here is what Ked’s equipment looks like. Hi Devonna, nice new website design! Looks very refreshing and cheerful! Thanks Hymne 🙂 I wanted it to be a little whimsical but without being too cutesy or girly. Not 100% sure if the background is right yet. I’ll have to live with it awhile to see if I love it. I play a level 41 hunter on dwarrowdelf, have been looking for a shady, dark, yet unique outfit. This has been rather difficult, as i am only lvl 40 and do not have access to moria and beyond etc.Could you give me some tips on putting together a dark, shadowy outfit that could be found in eriador by a lvl 41? Awesome blog you have here, going to check it out every now and then. Because RoI is coming out, I’ll be leveling my elven Lore-Master to 75, youve got any cool cosmetic ideas? How about something like this, Gloom-Bane? I think a male elf would look great in it too. I have in mind trying to give a ringwraith/nazgul style to my character as soon as his level will allow it. Do you have any tips ideas on how to reach this goal? Thanks you for your fast reply. I thought you were on holiday and did not expect it that soon. I will try it asap, since most pieces are accessible quite easily. I come to your website here a lot, I love seeing all the outfits you’ve come up with.. I’m a steed collector in game (hence my surname, Rochbaen, or ‘Horserider’) and I would looove to see more steed-related outfits if you ever have time. I think you should do an outfit to match the Algraig Steed, Mathom Steed, and Steed of Bright days. I’ve seen a lot of those around recently! Hehe, Hi again Mrs. D! There are four new horses that just got put in the store, as well as the Harvestmath festival coming up. Could you maybe make some outfits for the hardish-to-match Minas Ithil steed, and Steed of Night? Howdy! Still love the site. Have another request. Tomorrow is the 1st sunday of the NFL season and I need to support my team ingame! Looking for a San Francisco 49ers outfit for a Male Elf Hunter. Keep up the good work! I have a red outfit and a gold outfit, so I alternated between the 2. I recently got the last piece of my gold outfit today, so I’ll email a few pictures. Awesome, I’d love to see them. Thank you for saying so 🙂 and yes I can work on that for you. Give me a few days. Is this for a female or male Minstrel? Hey I’m Noah and i have a level 65 RK dwarf. and I was wondering if you might be able to find something that could be dyed that would look good on a dwarf RK. If you could that would be awesome! I can definitely try to put something together for you. Do you have Rise of Isengard by chance? Or… Possibly some more female elven hunter themes? Do you have access to a wardrobe? If you do this opens up so many outfit possibilities, otherwise we will have to stick to armour you can personally equip. Not impossible just more difficult. I can get it, yes. First of all, awesome blog. Cosmetics are such an amazing part of LOTRO, and you’ve done an equally amazing job in utilizing them! 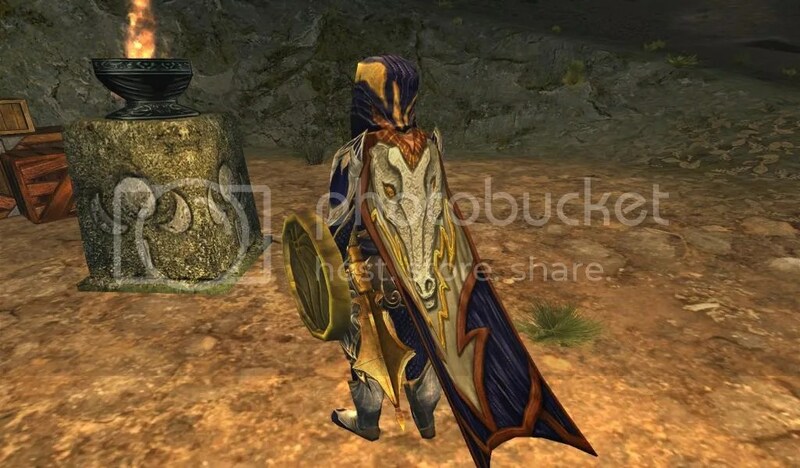 I have no idea if you can help me with this or not, but I’ve taken a great liking to a certain cosmetic piece in the game – the Hunter shoulders from Dar Narbagud. Unfortunately, I have no hunter toon, and the only other piece with the same look that I’ve found so far is the Shoulder Guards of the Keen Eye, dropping from certain 75 raid skirmishes. And as a Lore-master, my chances of nabbing those for cosmetics – considering the number of burglars and hunters who are after the 122 agility – are extremely slim. So, the question is – do you know of any other shoulders with the same cosmetic look? Any help would be greatly appreciated! I’m sorry but those two items you mentioned are the only one I know of 😦 Perhaps as time goes on people won’t need the shoulders as much and they wouldn’t mind you rolling on them for cosmetic purposes. Love your website/blog and am so glad that you decided to continue to make outfits as I find all of them so interesting. Yet despite all of your great work and advice I still am not able to come up with a look for my new character that I feel really suits them. I have a lv 30 Warden (leveling fast) hailing from Gondor who I really need an outfit for. I rp a lot and so my look is very important to me. Do you have any tips or perhaps even an outfit that would suit a Gondorian Soldier/Tower Guard? Any help would be great! PS. I do also have a lv 51 mini and access to a wardrobe, if that helps you at all. 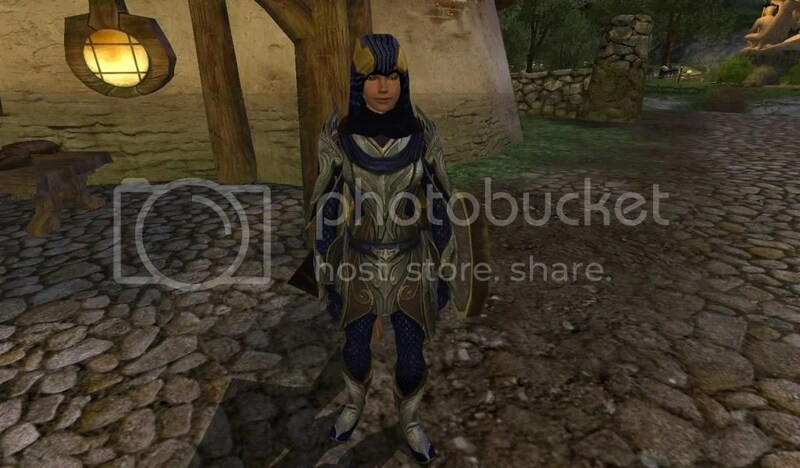 Hi Devonna, i’m 36 Dwarf Guardian and i’m F2P in few days i would get to 42 so i ask of you can you put for me any outfit ‘cous Devender of Blue Mountains (https://lotrostylist.wordpress.com/2011/06/04/defender-of-the-blue-mountains/) is not availabel ‘couse i bought only questpack for Evendim. It’ would be great if you help :). Have a nice day. Do you have access to a wardrobe? Not, sadly, by firs time i played i had access but now when Turbine blocked almost evrything i do not have access. Without a wardrobe it’s tough to put together a good looking heavy armour outfit at that level. A lot of the nicer looking heavy armour become available in your 50s. A couple good options for you is either the Great Burrow Heavy armour set which can be bartered at a “classic” vendor at any skirmish camp or Hauberks are another good option. A lot of the Hauberks in game have a chain mail look to them. You also said you purchased the Evendim quest pack, check out the Guardian barter armour in Tinnudir. Are store items ok to use? Hey Devonna I’ve been trying to come up with a good easy to find kinsip uniform for my Kin, The Lonely Mountain Band, In order to contribute to the whole band. I want something that really makes you think of a band without it being too hard to get and level friendly. What type of band? Marching band, rock band, slasa band ect..
Not really a type of band just a kinship all together with several different bands but something of the time period of a lute, medieval minstrel perhaps. Loved the Medieval Minstrels idea in fact much of my kinship wore red and white tunics/dresses last year so this may be perfect! Hay devonna love the site! well i was just wonderin how DO you acktually take photos and stuff? i know how to make everything dissapear(F12) but how do i acktually take the pic? thanks if you reply 😀 just want to take some cool pics of my epic new ranger outfits! Thank you soo much, later on once ive got some good ones ill email them 2 u for u to decide wether or not to use them on the site thnx again devonna! Hay devonna, i know you LOVE making ranger outfits so i was wonderin if you could make a dark/burglar sorta styled outfit, im a lvl 42 champion and thought something like a “Night Ranger” would be kinda kool, i can wear heavy,mediaum and light and i cant afford to buy store items but i can buy auction house items, i also have all the ROI pre purchase items. 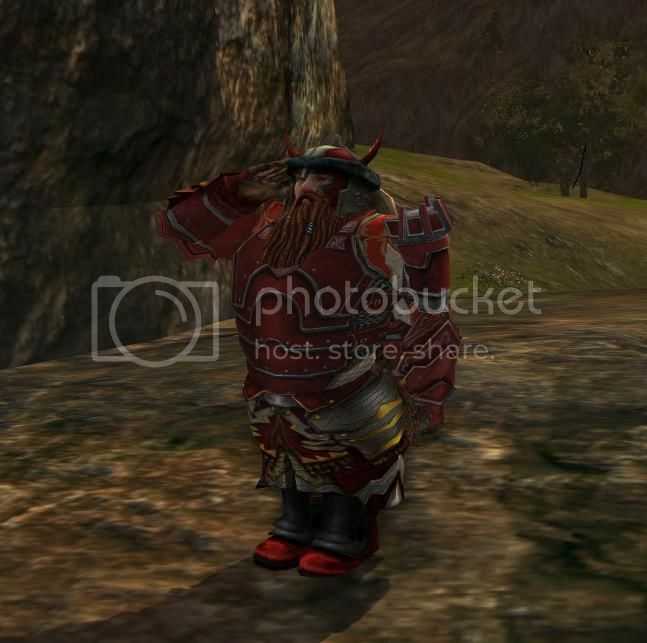 hi devonna how do i upload my pics to lotro styalist in guest submissions? You can send guest submissions to me here. You can email me with (1)your character name and server (2)A front and back screenshot of the outfit (3)What pieces you used and any dye information (4) A little blurb about your outfit. okies how do i take a screenshot? For clear screen just hit F12 and take screenshoot by F11, if i can give you a clue set your graphic to Ultra High of Very high. By the way to Devonna, i started my own blog, would you like to promote him a bit and tell me what do you thing about him? hay devonna did you get my guest submission? you know of bragathorn’s ranger outfit?? Here you go 🙂 Thank you for your submission. This is Angdalen of the Guard of the Citadel (RP) Kin on Imladris, this is in reguards to your “Tower Guard” outfit. I was wondering, if you knew of any items slightly easier to get by lower lvls that would be similar to that outfit, chest pieces, shoulders and gloves mostly. 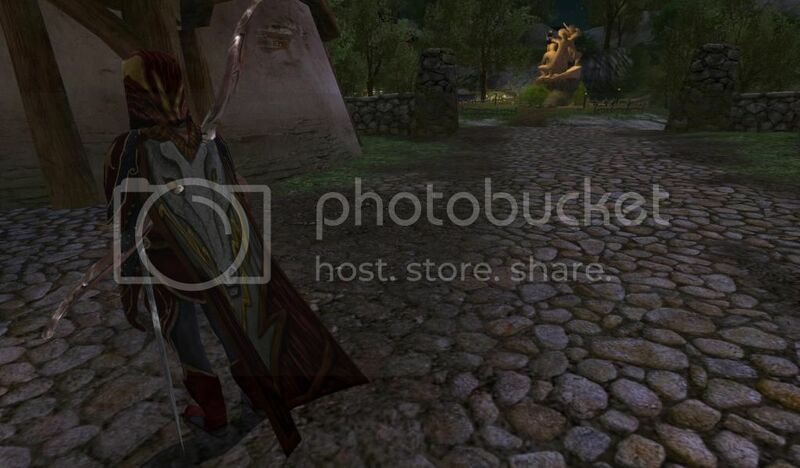 I’m looking forward to dress my lvl56 ((but climbing fast) Hunter as a Galadhrim Guard, thoose who stands by Celeborn. 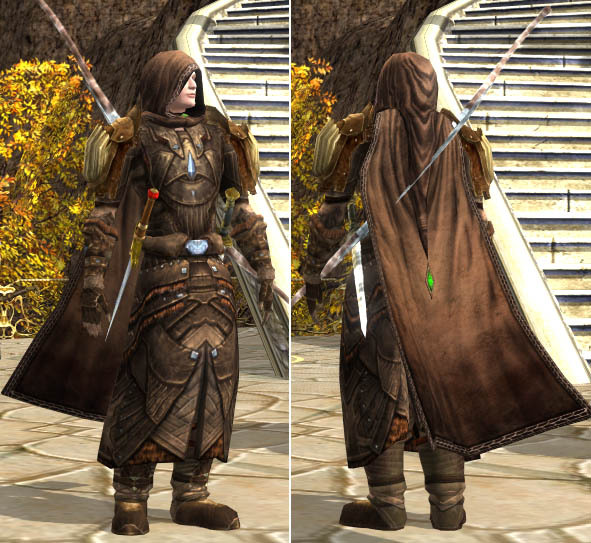 But i’m in troubles regarding the fact that they wear facial mask with a hooded cloak… I think that i could do something really close to my aim when i’ll have access to the tailor receipe in Lothlorien xcept for this mask… Any clue from a great stylist like you are would be much apreciated. If you have Dunland there is a hooded mask that you can get from several of the quests. Your level is just about ready for them. I went to Dunland at 65. Check out Dunland Marcher’s Leather Helmet. There are several other versions with this graphic also. Great thanks a lot for this. But i’ll have to work hard, the galadhrim recipes doesn’t react well to the dye (not as i expected at least), to gather all i need to try to have a similar apearance than Losdirith (or any other white guard of Caras). Hello Devonna, i do have to ask for favour of you, my blog is going well, slow but well 🙂 i have about 15 page viewers a day. But it’s not why i’m here, i would like to ask you a favour, could you publish my next outfit and whrite somewhere adress of my blog. If you only could, i think it would be great promotion, for sure from someone well known in LOTR:O world. if you wauld do it, tell me a word and i’ll send you the outfit :). Greetings, Hroldfrik from Imladris. With the release of the superultra awesome Hunger Games… Could you possibly give us a Katniss Everdeen-y outfit? Might be tricky, but it’d be super cool! I just love it to design new dresses for my Charakters. And some of them are realy well done (hehe). How can i show you my Ideas? I am playing a male Minstrel (race of men) on the german server Anduin and I´m searching for a new outfit. I thought you can help me creating an outfit without quest items (I sold them all) but i wish it could include the Lesser Secret of the West Helm (Burglar). I’ve been banging my head over figuring out an outfit for my Captain, who’s Level 37 at the moment, trying to find a good sort of heavy armor look for him. You don’t need to create a whole outfit for me if you find yourself short on time (you must be rather busy!) but if there are any favorite items of yours for heavy armor, I was hoping I could maybe keep an eye out for them as I work through my questing, or any tips you have as to creating an outfit. Thanks much for you time! I am trying to figure out how to make my main, who is a hunter from Rohan, look Rohirric and still have a archer/hunter/ranger look to him. If you can help out in any way it would be greatly appreciated. P.S. Love the site by the way. It’s gorgeous! Your outfits are wonderful believe me, so I was wondering….. since I’m to low a level to wear most of your outfits (23 elf male((hunter))) could you maybe mabye make something for around that level? I have been leveling a hunter lately. She is level 25 atm. It is very challenging to outfit her with only items she can equip at her level. I currently have her wearing the Thornley’s Robe I picked up from a quest in Breeland. There are three of these dresses. All are called Ceremonial Dress (confusing I know). They are each colored a different color (White, Green, Blue). They can not be dyed. Hey there Devonna! I’ve been looking over the site the last couple of days and its inspired me to update my Guardian’s outfit. He’s wore pretty much the same outfit since Shadows of Angmar with a minor change here or there to the helmet and boots. Its inspired me to make a new outfit that looks a little more up to date while not 100% overhauling him. It is rather hard to find a good plate chestpiece after all. When I get finished (nearly there, tweaking the cloak and boots) I’ll post back with some screenshots of him. If you like them, feel free to post them into the gallery. Suggestions for improvement are most welcome as well. I tweaked it a bit more and decided instead of going with a cloak, I would go with a backpack. I choose the turtle shell pack from the store. I saw al you’re outfits ! Af there realy amazing! I got a elf Guardian lvl 63. And I’ve not many Questpacks. Could you make Outher outfit with à (elfen) ranger? That the outfit could buy at outfitters. Because I don’t have any high craft so can’t make that, or have many turbine points to spend. I can say that this is à amazing site for al lotro-fans! Have you an idea for an (elven) ranger? And the items of the outfit could buy, not if you get It from à quest? Because I realy love Rangers! Hey Devonna, I am looking for a kin outfit that is not really hard to get but still looks nice. I have a lvl 36 Burglar that is going to be the kin leader and the kin is not going to be large like 10 people, the theme I would like is casual adventurer, Thanks. I’m from Brazil so i can’t purchase turbine points. I’m lvl 41, captain. Do you have any tip of an nice outfit for me? We need to start a groundswell for the next expansion – where they’d give us a cosmetic companion (like a vanity pet) that would have their own cosmetic slots, so we could dress them up and have them out around our houses and around non-combat towns – that would be so fun! Ivar’s Helm – from the OD deed. I have a female human character but I can’t find any shoulders or outfit to build up around her and make the helm look epic and super-scary like it should be! I think it’s a very difficult piece to put into a solid cosmetic….TP no issue, gear no issue…a solution – a must! I can think of a cloak i’d pair that helm with, Thin Cloak of Destruction, from the ROI quest Redeem the Abominations. One, Welcome back to LOTRO and Helmsdeep. Two, With the new expansion, and thus, new pieces, I was curious if you might be able to get a look similar to that of a clone trooper out of Star Wars. Any luck on my previous request/comment? Do you know what the Hunter helmet is called or where i can find it? Do you know if its possible to obtain some armor with same look? I have *green* version of it but it doesnt go well with lvl 65 annuminas light pants palette. This looks very similar to the Annuminas sets. You might try that. Sadly Annuminas light robe is somethign different, it covers pants completely. But I’ll keep looking, thanks! Hello, my name is Anaithus, or Wulfie to my kinnies, and I am on the Riddermark server. I was wondering how do I go about submitting an outfit I made for my cappy. I think it looks awesome, as do most who see it, thought it might be cool in case a fellow cappy is looking for a beast idea for an outfit. So I happen to run a kinship that counts a very certain someone as a member, and he clued me in that you ran this blog. I’ve had an idea mucking about in my head for a while, and was wondering how to go about making a submission? Would it suffice to simply give you the list of items in the outfit, or would screenshots be more preferable? Ah! Greetings Tharbadon! Glad to see you on the site! Unfortunately, we are no longer accepting submissions. However, I would love to see the outfit in game! I will throw it together, get it dyed and whatnot, then throw it on one of my toons for your perusal. I’m a long tome FTP player, and I love your site! I was wondering how one would “submit” an outfit to be put on the site. Hi Greg, thanks for stopping by. I’m not currently taking outfit submissions. I’ve looked through your archive, and I adore your styles! However, almost all of the outfits can only really be gotten by someone with a lot of turbine points, high level/advanced in the story line or who has bought the expansions. I have none of these. My main is a level 28 female human loremaster, and I was wondering if you could suggest some outfits that would look great but would still be relatively easy to get? Thanks for stopping by Halo. Have you seen my guide “How to Look Stylish At Any Level“? I have some tips for creating easy low level outfits. hi i have been following you off and on for some time. i like your outfits. however, recently my toons hit 66. as much as i love the latest armor, i found that nothing looks quite as good as the old armor- with some new cloaks. i am very glad we can use our old armor as costumes. these are links to the screenshots i took of them. it is night so they didn’t come out as nicely as i am used to seeing screenshots. the one in red is my hunter and the one in blue is my captain. They look very nice. I think the blue is my favorite. Really like the cape you chose to go with it. I’ve just got some of the medium Mathom Hunter gear and dyed it red for a Red/Black look. Is there any hooded cloak that I could get to look similar? I don’t really like the look of the helmet on the set. Just wondering whether this site is still active? And if so do you take submissions?? I’m not playing Lotro currently. I may or may not in the future play again. If I do start up again I would more than likely post to LotroStylist again. I keep the site up for anyone who may be interested in my old posts. At this time i’m not accepting submissions.